For almost twenty years British photographer Simon Phipps has been documenting the rebuilding of Britain after the Second World War through the work of architects. His archive documents Britain's post-war modernism and new brutalism in architecture and recognises the architects' enormous contribution to the transformation of the political and social landscape of the country in the aftermath of WW II. Significant building on a mass scale was realised and new building techniques were pioneered alongside innovative layouts, resulting in buildings of outstanding quality, displaying radical new forms. The construction ranged from public and private housing, to schools and universities, churches, museums, galleries, commercial and, ultimately, entire new towns. This new book features around 200 of Simon Phipps's photographs of some 160 buildings in all parts of England completed between the 1950s until the 1980s. They create a confrontation of buildings and architectural fragments, evoking a distinct atmosphere of brutalism. The essays and a conversation with architect Kate Macintosh contextualise brutalism in architecture from a British perspective. The book is published in conjunction with an exhibition at Museum im Bellpark in Kriens near Lucerne. 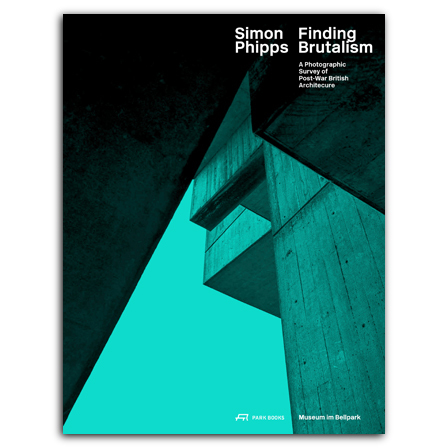 Simon Phipps Finding Brutalism was awarded a bronze medal in the 2018 German Photo Book Award.